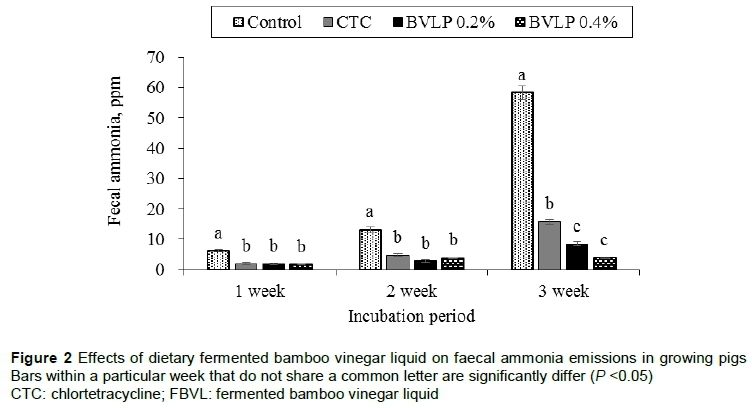 Fermented bamboo vinegar liquid (FBVL) was prepared through liquid fermentation of bamboo vinegar with multispecies probiotics, and its effect on growing pigs was investigated. A 42-day feeding trial with 84 growing pigs (28.0 ± 0.08 kg) was conducted to evaluate the effects of FBVL on growth performance, nutrient digestibility, faecal Escherichia coli concentration and faecal ammonia emissions. Pigs were randomly distributed to one of four dietary treatments, namely control, CTC (0.003% chlortetracycline), FBVL 0.2%, and FBVL 0.4%. Overall, the final weight and daily weight gain of the pigs in the CTC group were higher than that of pigs in the control group. Dietary supplementation with 0.4% FBVL reduced the feed intake of growing pigs, whereas the feed conversion ratio (FCR) was lower in the CTC supplemented group. The dry matter digestibility was higher in pigs fed CTC and 0.2% FBVL diets, and crude protein digestibility was improved in all treatment groups compared with control. The faecal E. coli numbers were reduced in response to CTC and 0.4% FBVL supplementation. Faecal ammonia emissions were reduced by dietary supplementation with CTC and FBVL at weeks 1, 2 and 3. In conclusion, dietary FBVL supplementation increased nutrient digestibility and reduced faecal E. coli population and ammonia emissions without negative effects on growth performance. Restrictions in animal agriculture on the use of antibiotics as growth promoters have led to the investigation of alternatives with potential antimicrobial and growth-promoting effects. Probiotics and compounds of plant origin have great prospects as antimicrobial alternatives, and have been studied widely in the last few decades. Probiotics reportedly exert growth-promoting effects by improving nutrient digestibility and modifying the intestinal microflora ecosystem (Choi et al., 2011). Sanders & Huisin't Veld (1999) suggested that multistrain and multispecies probiotics are more effective than monostrain probiotics. Furthermore, Cox & Balick (1994) reported that although active constituents may occur in low concentrations, compounds of plant origin may be better antimicrobial agents than synthetic drugs. Moreover, fermentation of plant-based compounds with probiotic bacteria may improve their nutritive and medicinal value (Oboh et al., 2008), thereby improving the performance of animals. Bamboo vinegar is a brown-red transparent liquid produced as a by-product during pyrolysis of bamboo charcoal. It contains more than 200 types of organic compounds, including acetic acid, phenolic compounds, alkane compounds, alcohol compounds, aldehyde compounds and materials (Mu et al., 2004). Akakabe et al. (2006) confirmed that bamboo vinegar with a pH of 2.5-2.8 can work as an insecticide, fungicide, bactericide and deodorant for treating malodour from pets. The utilization of bamboo vinegar as an animal feed additive is a new concept, and only a few studies of its effects have been conducted in pigs (Wang et al., 2012; Yan et al., 2012; Chu et al., 2013) and poultry (Ruttanavut et al., 2009; Yamauchi et al., 2010). 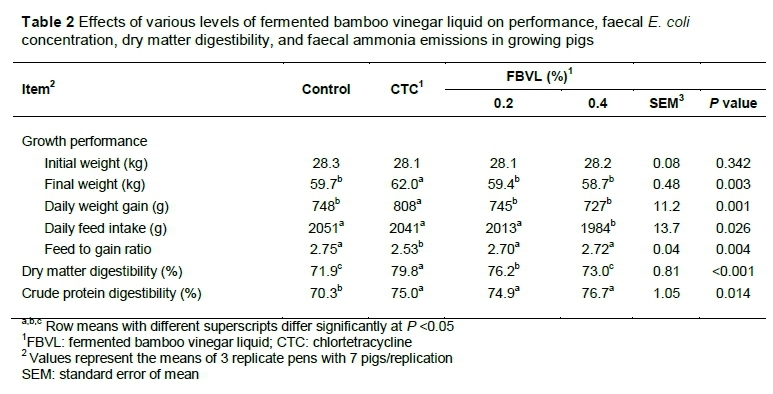 The studies on pigs (Wang et al., 2012; Yan et al., 2012; Chu et al., 2013) reported positive effects of bamboo vinegar on growth performance, nutrient digestibility, faecal microflora, and faecal ammonia emissions. However, no experiment has been conducted to utilize fermented bamboo vinegar in pig diets. This study therefore focused on the preparation of fermented bamboo vinegar liquid (FBVL) through fermentation with multispecies probiotic bacteria. The efficacy of dietary FBVL as an alternative to antibiotics on growth performance, nutrient digestibility, faecal E. coli concentration, and ammonia emissions was also investigated. Lactobacillus acidophilus KCTC 3111, L. plantarum KCTC 3104, Bacillus subtilis KCTC 3239 and Saccharomyces cerevisiae KCTC 7915 stocks were purchased from the Korea Research Institute of Bioscience and Biotechnology, Daejeon, Korea, for use as starter cultures for the preparation of FBVL by liquid fermentation. Bamboo vinegar was collected from a bamboo charcoal company (Chumdan Environment, Damyang, Jeonnam, Korea) and autoclaved at 63 °C for 30 minutes before being used. In the liquid fermentation method, 2 L of the autoclaved BV were inoculated with 2 mL of culture of each microbe separately and then subjected to fermentation for 48 h at 37 °C. To determine the number of cells in the FBVL, 1 mL of fermented liquid was diluted with sterilized distilled water (9 mL). Ten min later, 1 mL of the dilution was serially diluted tenfold in 0.85% NaCl solution and cultured on agar plates to determine the number of colonies. The microbial concentration of FBVL was as follows: L. acidophilus KCTC 3111, 4.2 χ 107 cfu/mL; L. plantarum KCTC 3104, 5.8 χ 106 cfu/mL; B. subtilis KCTC 3239, 2.6 χ 107 cfu/mL; and S. cerevisiae KCTC 7915, 6.2 χ 109 cfu/mL. The pH of the FBVL was measured directly with a digital pH meter (Uni pH Testa, Trans Instruments Pte Ltd, Singapore). The average pH of the FBVL was 2.6. The FBVL was then stored in the refrigerator until being added to the basal diet. This study followed proper ethical standards and was approved by the institutional Animal Care and Use Committee of Sunchon National University. A total of 84 two-line crossbred (Landrace χ Yorkshire) growing pigs (average age 68 ± 5 days and average weight of 28.0 ± 0.08 kg) were randomly assigned to four dietary treatments. Each treatment had three replicate groups and each replicate group consists of seven pigs. The pigs in each replication were kept in a slatted-floored pen (3 χ 2.75 m) with free access to feed and water for 42 days. The dietary treatments consisted of control, CTC (control + 0.003% chlortetracycline) and the control diet supplemented with 0.2% and 0.4% FBVL. A commercial pig grower diet was used as control. The FBVL was sprayed directly at two levels on corn-soybean meal followed by drying at 40 °C for 72 hours. The feeds were analysed to determine the moisture (934.01), crude ash (942.05), crude protein (CP) (988.05), ether extract (EE) (920.39) and crude fibre (CF) (962.09) according to the Association of Official Analytical Chemists (AOAC, 2000). Nitrogen free extract (NFE) was calculated by the formula NFE = 100 - (% moisture + % EE + % CP + % ash + % CF). The calcium content of feeds was determined with an atomic absorption spectrophotometer (AA-6200, Shimadzu Corp., Kyoto, Japan). 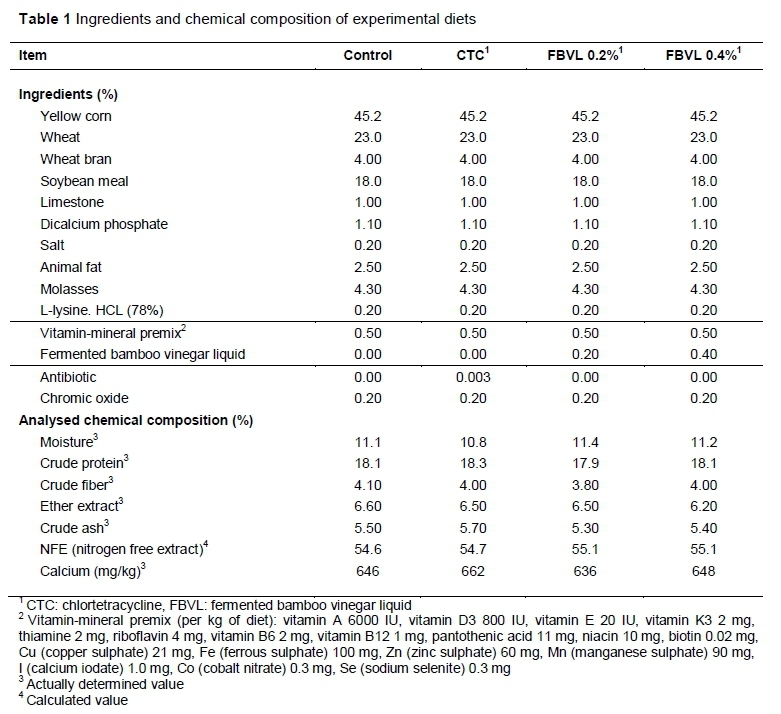 The ingredients and chemical composition of the diets are presented in Table 1. Chromic oxide (Cr2O3) was added to the diets at a concentration of 0.2% as an indigestible marker. Fresh faecal samples (approximately 2.5 kg) were collected directly via rectal massage into plastic sample bags from six pigs per treatment (two/replication) to determine nutrient digestibility, faecal ammonia (NH3) emissions and faecal E. coli concentration. All samples were stored at -20 °C for subsequent analysis. To determine the faecal E. coli concentration, 1 g faecal samples were serially diluted in sterile saline (9 mL) in a 1 : 10 dilution and then cultured on MacConkey Sorbitol agar media in duplicate. After incubation for 24 hours at 37 °C the colonies were counted. To determine faecal NH3 emissions, approximately 2 kg of the stock slurries were stored in a glass fermentation chamber equipped with a circulating fan for uniform distribution of heavy and light gas and a top cover with a hole to facilitate NH3 measurement. Samples were collected in triplicate for each treatment and allowed to ferment for three weeks. Prior to measurement, the slurry samples were shaken manually for approximately 30 seconds to disrupt any crust formation on the surface and homogenize the samples. Following each week of fermentation, the NH3 concentration was measured approximately 2.0 cm above the slurry surface at a rate of 100 mL/min using a gas sampling pump (model AP-20; Gastec Corp., Japan) and Gastec detector tube (No. 3L). In this experiment, all data were analysed by ANOVA using PROC GLM (SAS Inst. Inc., Cary, NC, US, 2003). Pens were regarded as the experimental unit for all parameters. Variability in data was expressed as the standard error of means (SEM). Alpha level for determination of significance was <0.05 and trends at <0.10. Data for growth performance, nutrient digestibility, faecal E. coli and ammonia (NH3) are presented as LSMEANS. Multiple comparisons were corrected using Bonferroni's correction. The effects of dietary FBVL on the growth performance of growing pigs are shown in Table 2. Pigs fed diets containing CTC had a 3.9% higher final weight (P <0.01) and 8.0% higher daily weight gain (P <0.01) than those fed a control diet (P <0.01). No significant differences were observed in the final weight and daily weight gain among pigs fed diets containing FBVL or the control. Dietary supplementation with 0.4% FBVL reduced the feed intake of pigs compared to those fed the control diet (P <0.02). However, it did not affect the FCR. Pigs fed diets with CTC had an 8% lower FCR than those fed the control diet (P <0.01). The digestibility of DM was 11.5% and 6.4% higher in pigs fed diets supplemented with CTC (P <0.01) and 0.2% FBVL (P <0.02) than in those fed a control diet, whereas the digestibility of CP was 6.7%, 6.5% and 9.1% higher in the CTC- (P =0.04), 0.2% (P <0.05) and 0.4% (P <0.01) FBVL-supplemented groups (Table 2). Pigs fed diet with CTC had the lowest faecal level of E. coli relative to the pigs fed with control diet (P <0.01), followed by the 0.4% FBVL supplemented group (P =0.03) (Figure 1). Dietary supplementation of CTC and FBVL reduced the faecal NH3 emissions in all measured periods (P <0.01) relative to the control (Figure 2). In the current study, the authors found increased final weight, daily weight gain and improved FCR in growing pigs fed the diet supplemented with CTC. These results are supported by the findings of Choi et al. (2011), who reported improved growth performance in weaned pigs (Landrace χ (Yorkshire χ Duroc)) fed a diet supplemented with CTC compared with control and liquid-fermented diet. Inclusion of FBVL had no effect on weight gain and FCR. However, 0.4% FBVL reduced the feed intake of growing pigs. This reduced feed intake may have been due to the presence of high levels of acetic acid (about 60%) in bamboo vinegar (Mu et al., 2004). Canibe et al. (2010) reported that dietary supplementation of fermented liquid feed rich in acetic acid lowered feed intake of piglets with increasing levels, indicating that high levels of acetic acid can impair palatability. Dietary supplementation of CTC and 0.4% FBVL reduced the faecal E. coli concentration relative to the control. The antimicrobial effect of CTC in reducing faecal coliforms was documented by Finlayson & Barnum (1973) and Choi et al. (2011). Chu et al. (2013) and Yan et al. (2012) reported bamboo vinegar as an alternative to antibiotics to reduce faecal pathogens in pig diets. In addition, Canibe & Jensen (2003) reported that supplementation of fermented liquid feed could improve the intestinal bacterial ecosystem of pigs by the probiotic action of the lactic acid bacteria. Choi et al. (2011) reported that multimicrobial probiotic (combination of Lactobacilli, bacilli and yeast) was more effective in reducing faecal pathogens by improving the fermentation capacity. 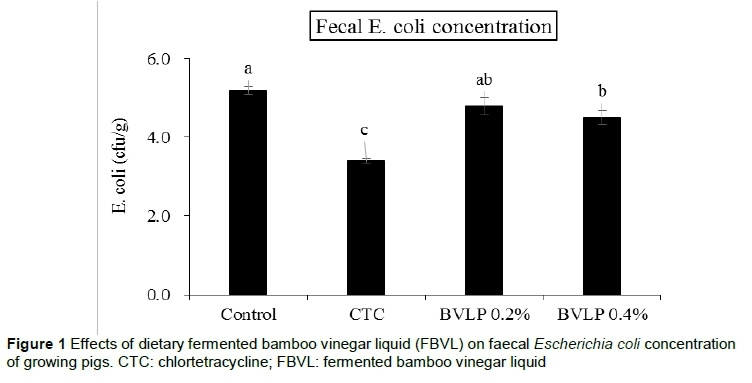 In this experiment, the reduced levels of faecal E. coli might be a combined effect of bamboo vinegar and probiotic bacteria. Digestibility of nutrients depends largely on the maturity, microbial ecosystem and pH of the intestine tract. Bamboo vinegar with a low pH, high level of acetic acid (27.75 g/kg) and phenolic compounds (14.63 g/kg) could influence the nutrient digestibility by lowering the gastric pH, modulating the balance of intestinal microflora and pathogens (Yan et al., 2012) or by improving the maturation and development of intestines via increasing the villus height and area, epithelial cell area and cell mitosis (Ruttanavut et al., 2009). In addition, Lactobacillus- and Bacillus-based probiotics have been reported to increase intestinal villi height and crypt depth ratio (Rao & Wang, 2010), reduce pathogenic microbial load, increase secretion of endogenous enzyme and thereby may increase nutrient digestibility. Choi et al. (2011) reported that antibiotics and probiotics could improve nutrient digestibility by allowing more efficient intestinal growth and improving intestinal microbial balance. The possible cause of improved nutrient digestibility in the FBVL-supplemented groups is the lower pH of the FBVL, which could reduce the intestinal pH and the concentration of E. coli, and thereby might increase secretion of gastric enzyme and reduce the microbial competition with the host for nutrient. The most interesting finding of the current study is that dietary supplementation with antibiotics and FBVL reduced the faecal emission of ammonia during all measurement periods. Consistent with the results of the current study, Chu et al. (2013) and Yan et al. (2012) reported lower faecal ammonia emissions in finishing pigs fed a BV-supplemented diet. The faecal noxious gas emission by animals is ultimately related to nutrient utilization and the intestinal microflora ecosystem (Ferket et al., 2002). Increased nutrient digestibility may allow less substrate for microbial fermentation in the large intestine, which consequently decreases the faecal noxious gas emissions (Yan et al., 2012). The reduction in NH3 emissions observed in the current study may be attributable to the reduced faecal E. coli concentration and improved CP digestibility induced by CTC, and FBVL may allow in less substrate for microbial fermentation in the large intestine. In conclusion, dietary supplementation of 0.2% FBVL improved DM and CP digestibility and reduced faecal NH3 emissions compared to control. On the other hand, supplementation of 0.4% FBVL reduced feed intake and improved CP digestibility via its suppressing effects on pathogenic E. coli, and faecal ammonia emissions compared to control and CTC without any adverse effects on growth rate and feed conversion ratio of growing pigs. Authors' ContributionsSTA and CJY conceived and designed the experiment. STA, HSM and SBS conducted the experiment. STA and HSM participated in acquisition, analysis and interpretation of data. STA has been involved in drafting the manuscript, while all authors have revised it critically for important intellectual content and approved the final manuscript.Conflict of Interest DeclarationThe authors declare that there is no conflict of interest between the authors and other people or organizations that could inappropriately bias their results. STA and CJY conceived and designed the experiment. STA, HSM and SBS conducted the experiment. STA and HSM participated in acquisition, analysis and interpretation of data. STA has been involved in drafting the manuscript, while all authors have revised it critically for important intellectual content and approved the final manuscript. The authors declare that there is no conflict of interest between the authors and other people or organizations that could inappropriately bias their results.